Emmy Mom--One Day at a Time: Great Canvas Pictures- and Giveaway! Great Canvas Pictures- and Giveaway! I love big pictures. I have big pictures hung throughout my house. When I say big, I don't mean 8x10, heck I don't even mean 11x14, I am talking 20x30 big. I love that when my photography clients come into my home they are able to see samples of pictures and artwork hung throughout my home. 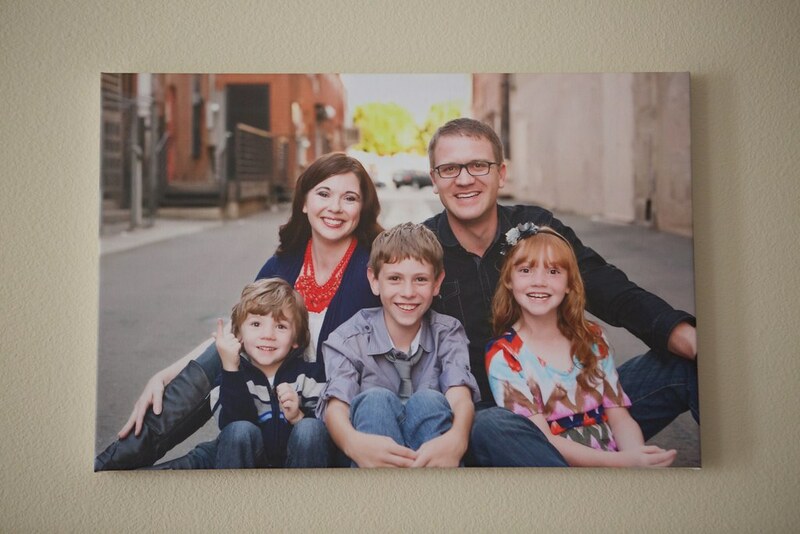 I was recently given the chance to receive a Canvas print from Canvaspop to Review. Now I will admit, I am very picky when it comes to my pictures. I will never get them printed at the big box stores, in fact almost all of my prints are through my professional printing service who does amazing and accurate work. Often when I try different companies, or companies that there might be a groupon for, as let's admit it we all do like to save money, I order a black and white print. I have found that most printing services can do black and white pretty good, but when it comes to color, all are not created equal and that is when I get really picky. I got brave and actually ordered a color print from Canvaspop, a 16x24 from our last photo portrait session and I love it! The colors are rich and deep, the edges are neat and folded nicely. It even came with a hanging wire and hanging hardware. I was very happy with the canvas. Canvaspop offers prints, the ability to add text to photos, collages and mosaics, and even the TriPytch Canvas. Today, I have a special giveaway, one of you will be able to win your own canvas! The winner will receive a 16x20 .75" frame canvas. You can use the entry form to enter below. Also, I have a special discount code for all of you- at checkout use the code EMMYMOM35 and you will receive 35% off your order! That is an awesome discount. This discount will be valid until May 31st of this year; but don't delay go order a canvas now! How do you display pictures around your home? You're family is so cute! There are a few photos I'd love to do this with. What a great giveaway and your family is beautiful - love that pic! That is always the tricky part! They do have some great collage canvases too, so it would be one 16x20 canvas but a collage of pictures. Gorgeous family! I love these types of canvas prints! Me too! 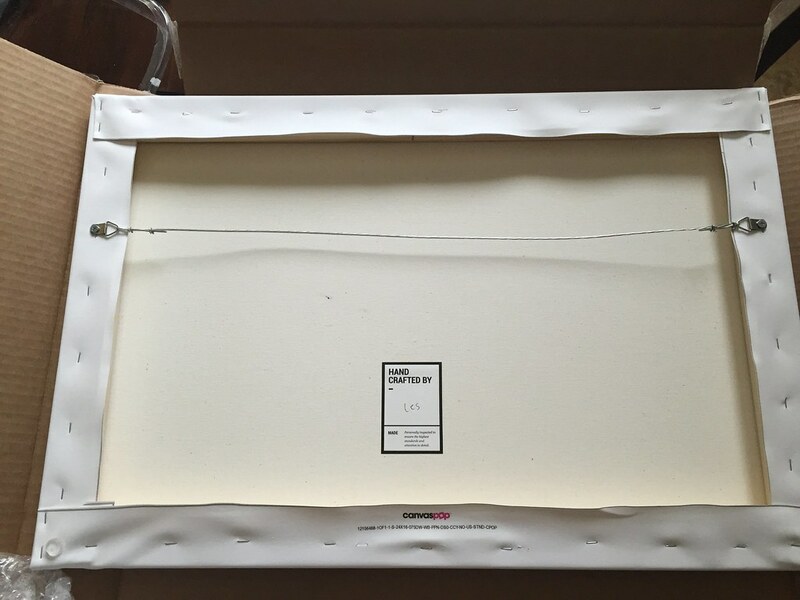 I really hate picking out frames, so I love having a canvas that you don’t need one! This canvas looks so nice - beautiful family! how cute! I love canvases. I would love to win this for a friend of mine - i'm sure she'd adore having a canvas picture of her kids. I put my photos in frames, but I really don't have that many, I wish I would put more up!